This morning I decided to take a quick walk over to the local duck pond. It’s only a five minute walk and is scheduled to be dredged sometime this summer. I was told it averages ten to eleven feet in depth, but presently with all the silt, it’s only about four feet deep. I haven’t fish the duck pound for about three years and I’ve only seen small pan fish in it. One side has back yards of private houses as its shore while the other side is public. 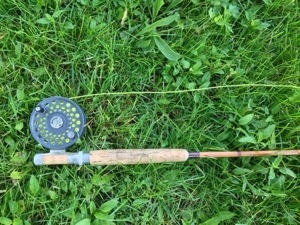 I decided to use my Orvis impregnated bamboo rod, 8′-0″, with a 6wt Lamson reel. 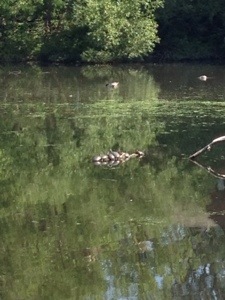 As I was setting up the rig I spotted a family of turtles sunning themselves on a log in the middle of the pond. I spent about thirty minutes casting and enjoying myself when it was time to head back. This entry was posted in Shaker Lakes by charles. Bookmark the permalink.